What is Cytomegalovirus (CMV) Retinitis? 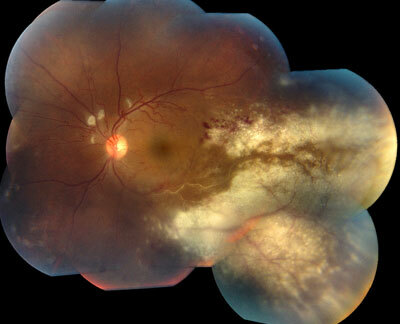 Cytomegalovirus (CMV) retinitis is a sight-threatening disease associated with late-stage AIDS. In the past, about one-fourth of active AIDS (Acquired Immunodeficiency Syndrome) patients developed CMV retinitis. However, this figure appears to be dropping thanks to a potent combination of drugs that help restore the function of the immune system. When CMV invades the retina, it begins to compromise the light-sensitive receptors that enable us to see. This does not cause any pain, but you may see floaters or small specks and experience decreased visual acuity (blurry vision) or decreased peripheral vision. Light flashes and sudden loss of vision can also occur. The disease usually starts in one eye but often involves both eyes. If left untreated, CMV retinitis can cause retinal detachment and blindness within just two to six months. AIDS patients sometimes also experience changes to the retina and optic nerve without clear signs of CMV retinitis. CMV retinitis is caused by the common cytomegalovirus; nearly 80% of adults harbor antibodies to CMV, which indicate that their bodies have fought the virus off successfully. In the case of AIDS, patients’ weakened or non-functioning immune systems are unable to stave off this virus. Other people with a weakened or suppressed immune system, such as those undergoing chemotherapy or a bone marrow transplant, are also at risk. Newer treatments are now available that can restore vision in some patients with severe uveitis and we specialize in these therapies here at the Retina Macula Institute.